Two more superstars to appear at anniversary gala! In addition to pop-soul queen Anastacia, 28-year-old virtuoso violinist David Garrett will be guest starring in Art on Ice 2010. Anastacia and David Garrett on the stage – Stéphane Lambiel and Jewgeni Plushenko on the ice… Like Stéphane Lambiel, Olympic gold medalist Jewgeni Plushenko returned to competitive skating some months ago. 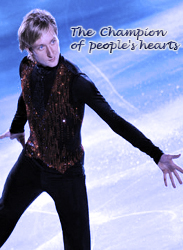 Like Lambiel, the Russian is one of the favorites at the Winter Olympic Games in Vancouver. Which of these two stars will be coming back from Canada with a medal? The figure skater and entertainer from Valais or the master of the jump from St. Petersburg? Which ever one it is, Art on Ice is pleased to have Lambiel and Plushenko – and the many other outstanding performers such as Sasha Cohen, silver medalist at the Turin 2006 Olympics, Kurt Browning, four-time world champion, two-time pair skating world champions Aljona Savchenko & Robin Szolkowy, two-time European silver medalist Sarah Meier or Canadians Marie-France Dubreuil & Patrice Lauzon, the married ice dancing world silver medalists in 2006 and 2007. Max, inform them that Plushy have new official site! Если кто соберётся в Swiss на шоу, буду рада помочь, встретится и т.д. I wondered, will he have power .... but our beloved "Superman" ... still performed last night at "Art on Ice" show in Zurich! ... about Plushy (and Olympics) from 3:39"
... always "diplomatic" responses from Lambiel .... perhaps because of the "fineness", he not have winning mentality as Plushy? Interviewer: The winner in Vancouver, surprising for many, was American Evan Lysacek. He didn't have a very difficult program. Apparently the judges want to see something different these days. Did you maybe have the wrong strategy? Lambiel: I believe the winner was the one who had the best performance that day. It's like this in any sport.. it's gotta be your time. One day might be your day and the next might not be. And I believe Evan seized his opportunity that day, he showed what he could do and he deserved it, he deserved the title. But there were many champions present in Vancouver who didn't win the gold medal. Interviewer: One of them, Evgeni Plushenko, is gonna be here at Art on Ice as well. He is not of the opinion that the right person won, he would have preferred to have won his second gold himself. :P Have you talked about that with him? Interviewer: Победителем в Ванкувере, к удивлению многих, стал американец Эван Лайсачек, у которого не была очень сложная программа. Очевидно, судьи хотели увидеть что-то другое. Может быть, у вас была не та стратегия? Lambiel: Мне кажется, победителем стал тот, у кого был лучший прокат в тот день. Это как в любом другом спорте… тебе должно повести. В один день может получиться отлично, а в другой – нет. И я полагаю, Эван сделала все, что мог, он показал, на что способен и заслуживает своего титула. Однако в Ванкувере было много чемпионов, которые не получили золото. Interviewer: Один из них, Евгений Плющенко будет выступать здесь на шоу Art on ice. Евгений считает, что на ОИ победил не тот спортсмен, он скорее предпочел бы выиграть свою вторую золотую медаль. Вы разговаривали с ним на эту тему? Last edited by Kiireke on 06 Mar 2010, 02:27, edited 1 time in total.